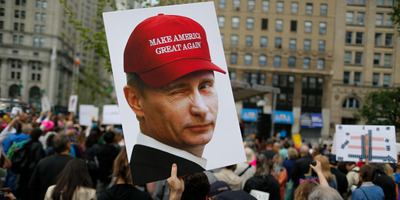 Eduardo Munoz Alvarez/Getty ImagesA demonstrator holds up a sign of Vladimir Putin during an anti-Trump ‘March for Truth’ rally on June 3, 2017 in New York City. This week, additional details about the IRA’s efforts spilled out after The Daily Beast reported on internal documents detailing the intricacy of its disinformation campaign and outreach to unwitting Americans during the election – and even afterward. The documents were part of a trove that was advertised a little over a year ago on a website that sells confidential and often sensitive information related to Russia. The seller did not receive any offers for the information, according to The Daily Beast. The IRA was responsible for pushing two previously unreported rallies in 2016 that took place near Atlanta and New York – one of which turned violent, according to the report. Facebook announced last year that “inauthentic” accounts most likely operating out of Russia had purchased $US100,000 worth of political ads between 2015 and 2016. The company added that Russian-bought ads reached approximately 10 million people and targeted users in Michigan and Wisconsin, both of which were critical to Trump’s victory. The US intelligence community concluded in January 2017 that the social-media operation was part of a larger influence campaign by Russia – and that assessment, according to former intelligence chief James Clapper, “did serve to cast doubt on the legitimacy” of the election outcome.